Seattle’s elite got their way when it came to repealing the head tax, but at what cost? They certainly outed themselves as callously opportunistic with no real plan to address the affordable housing crisis and little care for the homeless people suffering most from it. Here’s one example: Land use superattorney Jack McCullough (who is also a board member of the Downtown Seattle Association) told a cabal of disgruntled businesspeople that the head tax was “an opportunity to take back our city” and one members may not see again in their lifetimes, according to leaked minutes reported in The Atlantic. “What do we want? A new city council,” Tim Ceis reportedly added. Ceis was deputy mayor under Greg Nickels and has made a name for himself as a hard-nosed political consultant nicknamed “The Shark” by his enemies. Is Jack McCullough the Most Oppressed Seattleite? That McCullough feels dispossessed and wants to “take back” Seattle is rich. His tentacles are in deep. Few people have the kind of political access that he has as a DSA chair and political megadonor. And McCullough is the go-to guy for Seattle’s landed aristocracy. “I don’t use anybody else,” billionaire skyscraper-developer Martin Selig toldThe Seattle Times. McCullough was hailed as the powerbroker and mastermind of the Grand Bargain that gave us the Mandatory Housing Affordability (MHA) program, the centerpiece of the Housing Affordability and Livability Agenda (HALA). “Jack wanted to do something for working people,” then-mayor Ed Murray opined in 2015. He’s also probably a big reason why the downtown inclusionary zoning (aka MHA) requirements are relatively low. MHA requires developers to reserve a set number of new units to be set aside for people making 60% of area median income or less–or pay an in-lieu fee. Downtown MHA requirements ranged from 2% to 5% (depending on zoning type) despite having the highest land values in the city and often gaining more height and capacity in the paired MHA rezones. Elsewhere in the city, MHA requirements ranged from 5% to 11%. Of course, inclusionary zoning wasn’t McCullough’s idea; he came to the HALA bargaining table after the Seattle City Council, led by Mike O’Brien, began to move on a linkage fee in 2013. In fact, McCullough sued the city over the resolution to pursue a linkage fee. Councilmembers agreed not to pass the linkage fee when MHA replaced it and still got to 6,000 new affordable homes. Some developers are still upset to face a fee at all, even after getting upzones in exchange. That Councilmember O’Brien was singled out by the No Tax on Jobs coalition and targeted with Chamber-placed Facebook ads comes as no surprise. How Far Would Seattle’s Elite Go to Save 14 Cents per Hour? Where did they get all this money to spend on taking away nearly $250 million in affordable housing and homelessness services funding? Well Amazon, Starbucks, and Vulcan Inc. each gave $25,000 to the campaign. To the billionaire CEOs behind each of those corporations (Jeff Bezos, Howard Schultz, and Paul Allen), that’s pocket change. Does the Chamber Have a Plan? “I do not know that more revenue would solve it,” she said. “The city has been spending more and more on homelessness and it’s been getting worse.” She suggested trying something new, a “moonshot” type solution that reinvents the city’s approach to homelessness and affordable housing. She suggested using technology and evidence-based approaches to fight the problem. Amazon, for example, specializes in logistics, she said—why not apply the company’s expertise in helping people move through Seattle’s housing? What little plan the no-tax crowd has is arguing what the city has already been doing is enough. The Seattle Metropolitan Chamber of Commerce argued upzones, not new progressive funding sources, would be sufficient to deal with the crisis. She pointed to the MHA rezones already in motion–ignoring that these only touch about a fraction of the city and leave 94% of single-family zones untouched. The Downtown Seattle Association has also argued the city already has enough money if only they’d spend it wisely. Here’s the thing though: What we’re doing isn’t enough. Report after report–whether the Poppe or McKinsey–has argued for increased funding for affordable housing. McKinsey report suggested $200 million additional dollars per year are needed to house the homeless. Anyone arguing with any intellectual rigor would acknowledge that the money we’re spending on homelessness is having a big impact even as the problem grows larger and point-in-time counts go up. That’s because rising rents continue to push more people into housing insecurity and homelessness. The scale of our response has to increase as fast as rents do. Seattle has also not gone far enough to gear its land use to create affordable housing. Indisputably single-family zoning has led to the creation of luxury housing only the rich can afford when you look at median single-family home prices, which have reached $820,000. You can see this spatially in a map of home prices. 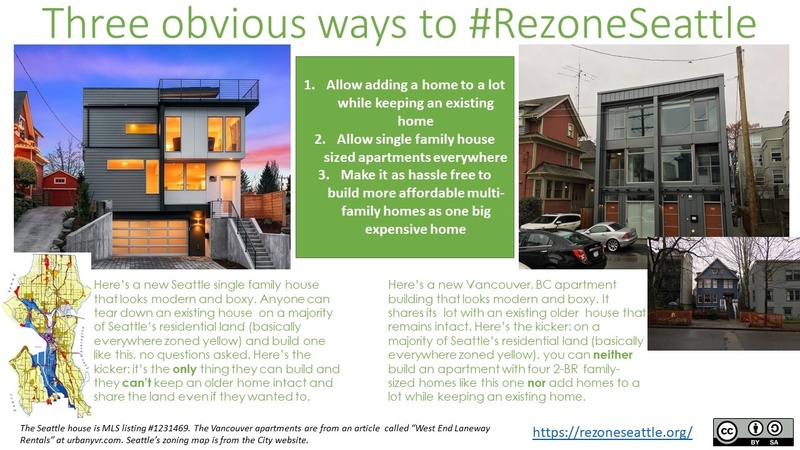 The battle to rezone Seattle is an important one, but it’s not a get-out-of-jail-free card for opponents of progressive sources of revenue for housing. Anyway, what exactly are they proposing? Are they saying the MHA rezones are insufficient? If they aren’t, what would a Chamber-backed zoning solution look like? We didn’t hear much of a peep out of the Chamber or the Downtown Seattle Association when Mayor Murray backed away from broader changes to single-family zones. They invested their real political capital buoying the corporate bottomline, not on altruistic do-gooding to alleviate the housing crisis. Philanthropy is another business-friendly “solution” brandied about, but it’s hard to imagine on a $200 million per year scale, particularly when Seattle has been in a “state of emergency” for three years without philanthropy rising to the challenge to close the housing gap. Formerly known for his stinginess relative to other billionaires, Bezos announced yesterday he has come to a big philanthropy decision. The timing is conspicuous considering he just helped kill a $47 million per year steady stream of housing and homelessness funding. Businesses claim they were blindsided, but this was a slow-developing tax. A progressive revenue task force has been working for seven months to craft a recommendation, and the Chamber was invited to be a part of the task force. Chamber leaders declined saying they didn’t want to be demonized and yelled at for a problem they didn’t create. You might think homeless people suffer the most in this crisis, but just think of the yelled-at business executive! No one actor is solely responsible for the housing crisis in which we find ourselves. Nonetheless, for the business sector to claim absolute innocence doesn’t fly with the facts. For one, many of the same elites helped starve the government of revenue by opposing the state income tax (e.g., Bezos, Ballmer and Allen) and later the city income tax. As the titans of industry they should rightfully take responsibility for the pressure a booming economy is creating. More supply would help, but we’re facing tremendous demand fueled by an influx of high-income earners. Supply has to catch up to demand for price increases to flatten out. We’ve had a quarter or two of good news, but before that Seattle led the nation in rent growth for a decade. It’s going to take more than a flat quarter or two to ease the rent burden inflicted on working class households. It’s not just Amazon driving demand, but let’s remember Amazon’s Seattle headquarters had only 5,000 employees in Seattle in 2010 but has grown to more than 40,000 today. Any city would struggle to meet such a dramatic jump in high-end demand. What the No Tax on Jobs coalition did was remarkably similar to what the Tea Party did in 2010. A small group of disgruntled activists vastly magnify their political might via a massive influx of corporate cash from donors who are really pulling the political strings. Tim Ceis said the business community wanted a new city council, and since the Chamber endorsed most of the Democrats sitting on the council who knows…maybe they’re ready to give the Republican Party a try. The Chamber did face some defeats in 2015 investing heavily in Shannon Braddock only to see her lose to Lisa Herbold–and of course they tried to unseat socialist Kshama Sawant–who makes big business a perennial punching bag–investing in her opponent Pamela Banks. Sawant won anyway with 56% of the vote. At the same time, the Chamber backed Bruce Harrell, Rob Johnson, Sally Bagshaw, Debora Juarez, Tim Burgess, and Lorena González and saw them all win in 2015. In 2017, the Chamber faced the misfortune of its trusted pal Tim Burgess retiring and the Chamber-backed candidate, Sara Nelson, failing to make it through the primary. Given their options, the business community seemed to favor Teresa Mosqueda over Democratic Socialists of America candidate Jon Grant, and she won. In the mayor’s race, though, the Chamber’s hand-picked candidate, Jenny Durkan, waltzed through the primary and general election, giving them a veto of this supposedly runaway council where they only have their hooks in five of the nine members. By the same token, flip-flopping councilmembers could face a challenge further from the left. Tammy Morales has been vocal that Bruce Harrell’s repeal bill was out of step with his Southeast Seattle district, which has been hit hard by the housing crisis and displacement pressures. After winning by a margin of only 345 votes, Council President Bruce Harrell has to be worried–or at peace with retirement. The head tax ordeal has shown progressives can take nothing for granted. Tackling the widening gap between the haves and have-nots just isn’t on the political agenda for some. We should be wary as conservative business interests co-opt urbanist language to change the subject and block much needed funding. Supporting upzones doesn’t mean we don’t expect Seattle’s richest to chip in for affordable housing and social services from the ever-expanding mound of cash they’ve extracted from Seattle’s economic boom. Correction: An earlier version of this article misstated that the head tax was $0.18 per employee hour. We briefly went with $0.13 per hour but settled on $0.14 after consulting the actual bill language. Additionally, we corrected a sentence stating the Seattle Metropolitan Chamber of Commerce funded Morning in America. No Tax on Jobs is organized separately from the Chamber, although the donors are similar. Seattle’s “elite”? You mean the rational people who are sick of handing blank checks to incompetent politicians and their lackey department heads? I think the context makes it pretty clear who he meant, as a class. How far would Seattle’s elite go to avoid the 14 cents per hour head tax (which works out to about $275 over the course of year)? Well, many of the same donors that fund Seattle Metropolitan Chamber of Commerce’s political action committee funded a newly formed No Tax on Jobs PAC which paid $250,000 to Morning in America–a political outfit that has worked for the Trump campaign and is named after a Ronald Reagan speech–to do paid signature gathering. If you’re looking for specifics, he starts with Amazon, Starbucks and Vulcan, but he might be able to point you to the whole list if you’re interested to see if you’re among the economic elite. Excellent piece. The housing supply ecosystem is broken. Doug knows it..he’s seen a healthier one in the Twin Cities and other major cities, as have I…its an EASY answer but…for some reason..the powers that be are not addressing with action steps..why? Follow the Money. Due to self serving laws that protect large scale apartment owners and their trial attorney friends, we are missing a HUGE market segment in type and price point of appropriate development, condominiums, that in major urban areas like ours where homes are as expensive as they are are above 40% of the Market Supply…here…less than 10%. That ONE factor is THE BIGGEST issue…with other variables. Zoning and GMA improvements and allowing for residential/mixed use to be added into retail/commercial districts as appropriate are there too..also smaller multi units..vs BIG boxes 2 feet away from each other via short plat. We’ll sell 10% fewer units in the Seattle Market area this year than when we were half the size…with ALL this eco growth since..why? because the 1% wants theirs..and a LOT more of yours! The resulting Affordability crisis is now hitting commerce, not just the consumers of housing, hard….watch job growth plummet….unless we fix our Housing Supply Ecosystem. We CAN do it…but as the author suggests, Business needs to help move to “YES” on the fixes….shame on them if they don’t…because they will be hurting the economic growth of their members..and of our ENTIRE community. While it would be good to see more condominium action, in lower markets than the downtown skyscrapers, I don’t think you’ll get it by just cutting off liability, as much as the Master Builder types would like that. I understand that liability in Vancouver is equally or more stringent, but it doesn’t stop them there. There are a handful of other issues. Real estate owners in a hot market who have the choice between selling, and holding while collecting rent, are likely to prefer the latter. Lenders have plenty of borrowers lined up with less difficult properties – typical condo will be complex to maintain, complex organizational structure. I know someone who can’t sell his condo because the building has too many renters, and lenders don’t like that – so if he can’t stay, he’ll have to rent it … There’s more, I’m sure. This was a disappointing, foolish article. It is meandering and poorly written, surprisingly narrow and personal, and filled with straw man arguments. The sinking feeling in my stomach began with the title’s juvenile tone, and unfortunately, my dread was paid off. 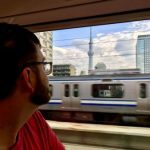 I read the Urbanist every day, and this is easily the worst article I’ve ever seen on this blog. It’s worth noting that there are plenty in the business community who are for more funding, including myself. I’m on the Chamber’s Policy Leadership Group, for goodness sake (though I speak only for myself here). Most of the evil corporate titans I know who are okay with more funding just don’t think the tax should be as overwhelmingly perverse as one on jobs. The Chamber has also been very clear that is has a problem with the fact that the Poppe report’s recommendations aren’t being followed. Given that they are concerned with the lack of evidence-based spending, it’s not surprising that skepticism regarding greater funding is prevalent, and that people are willing to attribute the rise in homelessness at least partially to mismanagement. I know many who opposed this tax who would gladly pay a different tax, especially if the evidence were followed. Many in the business community unsurprisingly think it is silly to, say, confine a tax regime to an 80 square mile territory while targeting global corporations whose behavior is extremely elastic, especially when that (elastic) behavior drives over $100M in annual construction fees for the city itself. I know the constitution makes it hard to tax progressively. But this was just perverse policy-making: self-undermining, and an unimaginative, wedge-driving waste of political capital. Now the regional, comprehensive kind of solution that would actually seriously make a dent is going to be much harder. That was overwhelmingly predictable. BTW, it’s also worth noting that many of us support wholesale upzoning, or strong HALA like incentives across the city, and not just in the tiny existing urban villages. There are a lot of NIMBY rich people out there, but there are a lot of people in the single family neighborhoods who want to see change. Try not to paint everyone with the same brush. I agree. The Urbanist has really disappointed me lately. I once hoped that The Urbanist would serve as a bridge between Seattle’s “progressives” and more mainstream liberals, who now preside over both the mayor’s office and state government. I had hoped that The Urbanist would help the Seattle left to focus on supply side economic issues (zoning and HALA), rather than being stuck with rent control and other non-solutions to our housing crisis. Ron has capably rehashed why the Jobs Tax was so potentially harmful to the city. Your interpretation of the groundswell of anger against the City Council shows you didn’t learn anything. The Urbanist picked the wrong horse. I do read the Urbanist every day, but I probably won’t be contributing again. Thanks for reading. I’m sorry that we don’t see eye to eye on this issue. I’m not trying to paint everybody with the same brush, but I do think it’s significant when we lose $47.5 million per year in funding with no plan to replace it. I welcome the possibility that I could be wrong about this, but at the same time three years into Seattle declaring a state of emergency, we still haven’t reversed the trend or come up with a major new source of funding. You say the problem stems from mismanagement not a dearth of funds, but I still haven’t heard a credible management solution that somehow squeezes efficiency out of existing funding to shelter 6,320 unsheltered people. Anyway, I probably won’t convince you or you me, but let’s work together where we agree. The fight for fairer zoning is important, and I’m glad to have allies. Doug, I appreciate you taking the time to reply and I appreciate you looking for areas of agreement. I’d add more interestingly – When a credit ratings agency does this kind of analysis, it is making an expected value judgment. Think of that as a kind of average of all the likely outcomes. The problem is, that tells you nothing about the *distribution* of outcomes. If there were a 50% chance of a spectacular outcome, and 50% chance of cataclysm, the expected value would be middling! While neither utopia nor apocalypse will happen here, there could be a significantly binary set of likely outcomes (“bimodal” as the statisticians say). After all, one company is the target of 20% of the tax, and is driving the vast majority of growth in the city, and it and its peers like Zillow and Starbucks seems pretty pissed. Amazon may respond negatively, or it may not, and the outcomes would be vastly different. Expected value calculations poorly capture this. They are taken from broad data sets and averaged, not paying attention to the actual political economy driving the decisions. Nor does this one seem to pay attention to the likely (small groups of companies = small samples = which means noisy outcomes). -Those players are driving construction in the city, which is responsible for ~$110M of revenue this year (no, that won’t put the city’s finances at risk, but it would mean that the $47M isn’t anywhere near net $47M). -The debate got emotional, so the “incentive” impact on the deciders may significantly exceed rational analysis, into symbolism, or just in to perceived future risks. -Political capital is limited and this approach burned a lot of it, which hems in broad alternatives that will likely produce real outcomes. When I look at this problem, which needs a serious solution, it’s hard for me to conclude that the head tax has much value beyond the symbolic. It creates a high risk of undermining itself in terms of revenue source, its such a small partial solution, and it uses up most of the political capital needed for the actual outcome. I agree that major corps need to pay higher taxes. I just think 80 square mile municipalities don’t have the heft to actually get it done. The supply of houses in Seattle has been dwindling due to tear down and replace with apartments. Decreased supply of Single Family Houses has contributed to the large increase in housing costs. This is true through out the city. 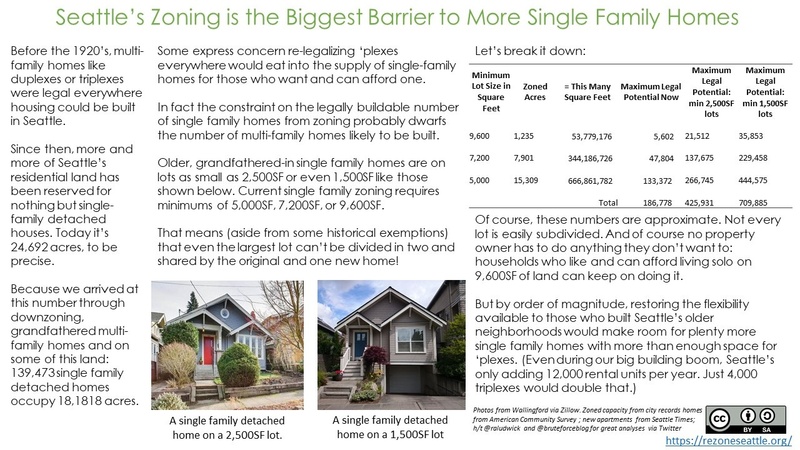 If you’d like more single family homes, you’ll love (re)legalizing small lots. Yes, let’s preserve existing single family houses, they should not be allowed to be torn down. It’s easy to add apartments while preserving existing family homes, if we legalize it. We could even incentivize it. Win-win all around. It’s easy to add apartments while preserving existing family homes, if we legalize it. We could even incentivize it. I think that if I put an apartment in the back yard of my former house on Queen Anne Hill most people would not find the unit affordable. For numbers let’s say 1,000 sq ft @ $350 per sq ft building cost. If I got a re-zone and built condos I would expect them to retail for 750k. When my wife and I bought the house 15 years ago it was a fixer and it took two good incomes to qualify for a loan. Everyone on that street has advanced degrees or some special talent to afford the area. If you are not a high achiever you are just not going to live in the area. Regardless of zoning. Sure, liberalizing zoning doesn’t mean everyone gets a pony – but retaining restrictive single family zoning means the vast majority of people are totally zoned out of most residential land. 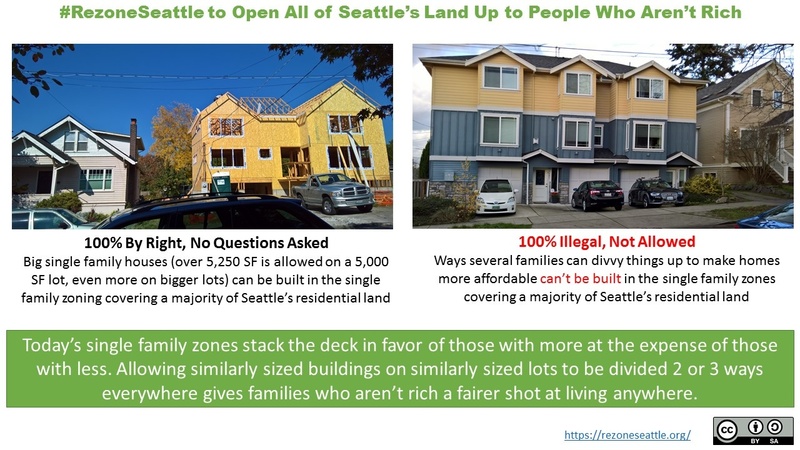 A lot more people would find that apartment or the condos affordable compared to single family homes…”right” side of image is way more affordable than “left.” Changing the zoning enables 3 (or however many) families to pool their resources to compete with the 1 who can afford the big house. So looking forward to Bruce Harrell leaving. For being in office since 2008! He’s really done very little. While I agree with much of this article, an income tax is likely untenable and the push to change the state’s constitution would be a very long one. In the meantime there are many practical ideas at the state and city level to tax wealth (specifically the wealth of high worth individuals), a more equitable strategy overall anyways. I’m sorry, but killing the head tax wasn’t responding to ‘ conservative business groups’, it was responding to the clear will of the voters. You don’t get polling numbers as bad as the head tax had in Seattle without a majority of voters of all ideological stripes being against it. There’s been a 20% increase in city tax revenue per capita since 2010. The city has plenty of money; it’s their spending priorities that are out of whack. I don’t think you would have gotten polling numbers like that without a lot of misinformation, either, and there was plenty of it. I would desperately like to see the current council gone, with very few exceptions, but this kind of politics scares me worse. The Tea Party comparison is apt, and it’s a disappointing development. The council’s retreat on that was good strategy, but as you say, we’re left with the question of how to move forward now. Durkan is stuck with problems that have been piling up for years, partly inevitable at the current rate of growth and partly the result of past administrative ineptitude. She will have to convince the public that the administrative ineptitude part is history, and she’s going to need a lot of public attention that she wouldn’t be able to get while simultaneously fighting corporate funded disinformation campaigns etc. Meanwhile, the income tax isn’t dead yet, right? and a progressive income tax would be a much more elegant solution than the late head tax. If you think Seattle “elites” are the only ones against the head tax, I don’t know what to tell you. You don’t have your finger on the pulse of this city at all. I’m a Seattle native, certainly not elite, and I’ve never voted Republican in my life… and I’m against the head tax.